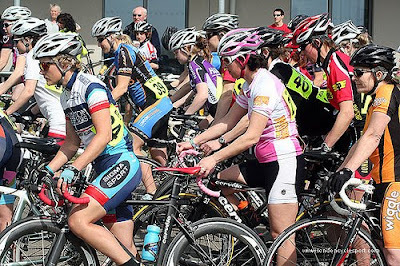 London Women's Cycle Racing: Battle of the Hoggenberg! Saturday 10th April. On a sunny Saturday afternoon at Hog Hill, around 40 women lined up at the ELV Spring Rumble for round 2 of the LWCR League. This was the first round that included all cat women racers. Riders from across London and beyond made the trip down to do battle on the Hoggenberg. The 40-strong field crossed the start-line and stayed together during the opening laps before it split after the prime, which was won by Mathilde Pauls (Pearsons CC). An aggressive pace set by the front group split the field into two main groups, with a few gruppettos at the tail end of the field having their own mini battles. With 4 laps to go, Maryka Sennema (Kingston Wheelers) and league leader Elise Sherwell (Pearson Cycles) animated things in the 18-woman leading group when they put the hammer down just before the Hoggenberg. A number of contenders, including riders from Rapha Condor and MuleBar Girls dropped out of contention at this point, leaving the eventual winner to come from the remaining select group of 9 riders. Among them were strong locals like Twickenham pair, Dorchie Cockerell and Natalie Cresswick, and a London Dynamo pair in the shape of Rachel Armitage and Lauren Whitmore. 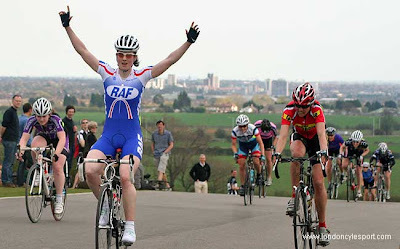 As ever, the outcome was decided on the final climb when Sennema launched an attack, but was caught by RAF rider, Jacqui Marshall who won the race, and youth rider Emily Kay (Halesowen) who finished in 2nd. London Dynamo’s Lauren Whitmore, who was 9th, was the highest placed 4th category racer. League leader Elise Sherwell finished in 6th place - good enough to go into the next round, at Crystal Palace, wearing the leader's jersey. Reactions: Maryka Sennema (Kingston Wheelers): Coming third is a satisfactory result, as I certainly wouldn't have said going into the race that I was the third strongest rider! We had a great field. With nearly 40 starters, that’s about four times as many as we usually get at Hog Hill! Finally, a "proper" race! I'm just really happy that we got so many riders out for one of our rounds. To me, this is what I thought we should and could accomplish with the LWCR: proper races with proper fields full of riders at all levels. It was so satisfying to line up with 38 other women at the start line, and I really hope we continue to draw such fields to our races for the rest of the season. A new page in local women's cycling! Graham Galvin (East London Velo), Organiser: We are over the moon at the turnout for the Spring Rumble. I would have been happy if 25 turned out, but to have more than 40 women racing, including the two who rode in the men’s race, is amazing. We always like to support women’s racing and we are really pleased that this has taken off. The London Women's Cycle League league is a great introduction to newcomers like me to road racing. 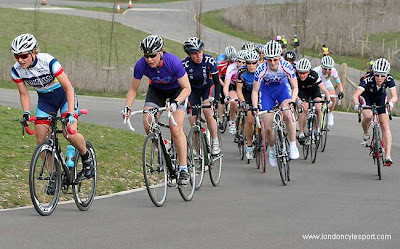 Goodwood was my first ever road race, and the wide course was ideal for anyone not used to cycling in a tight bunch. To my own surprise, I really enjoyed the tactical aspects of the race, including the sprint at the end. As expected, Hog Hill turned out to be technically quite challenging for someone like me with little road riding experience. Having done some cyclocross races over the winter probably helped me when I missed one of the corners during the first lap and, to the amusement of the others, ended up going straight down across the grass to re-join the field at the bottom. Fortunately, I was still riding my cross bike, although I did worry a bit that I would damage the fancy wheels I had borrowed for the race. The good thing about Hog Hill was that it did not seem to matter too much that I was dropped early on. Even riding on my own, I never got bored on the varied course. Going at my own speed allowed me to explore the downhill section at a slightly more gentle pace, while using the uphill part to make up some of the places I had lost in the first few laps. I'm now definitely hooked and plan to head to Hog Hill again next weekend, [at the Eagle RC Circuits] with the main aim to stay on the tarmac!